As investors scramble to gather as much information about Airbnb in advance of their impending IPO (rumoured to be scheduled for some time later this year), here are our thoughts on what makes this company a truly remarkable unicorn. What do Syria, Iran, North Korea and Vatican City have in common? The answer is that they’re the only countries on earth where you can’t book an Airbnb. Such is the scale of Airbnb’s global network, they now offer over 5 million listings across 81,000 cities in 191 countries, accommodating 400m guests since the company started in 2008 and currently hosting more than 2m people every night in an Airbnb property. All without owning a single property. Actually, they did decide to brand some apartments in conjunction with a developer in Kissimee, Florida, stopping short of actual ownership. To top things off, they have a startup story worthy of a Hollywood movie: in 2007, Joe Gebbia came up with an idea to help ease rental difficulties when a design conference came to San Francisco. Making room in their loft, he and housemate Brian Chesky put in three air mattresses and offered a night’s bed and breakfast via a simple website: airbedandbreakfast.com. As they say, the rest is history. Or not. As the company marches towards a 2019 IPO, carrying an expected valuation of between US$53bn and US$65bn, it’s easy to assume that Airbnb’s is a story of a great idea, told to a few privileged investors, who are reaping the benefits while everyone else looks on in envy. As Churchill said, “history is often written by the victors”, who compile it in in reverse, embellishing wins and downplaying losses. In truth, reality couldn’t be further from that: a relaunch in 2008 went unnoticed and a round of pitching in 2008 to 15 investors was ignored by 7 and rejected by 8. They tried replicating their formula of getting hosts to rent out space during the 2008 Denver DNC, but the site made no money from these matches, forcing them to sell limited edition Obama Os and Cap’n McCains cereal boxes at $40 apiece to make revenue. Even after they were seeded and mentored by Paul Graham’s Y Combinator, they faced rejection from investors who failed to see the potential. Only in April 2009 did they score their first sizeable funding round with Sequoia, and finally manage to get on the front foot (and the gas pedal) in 2010. From then on, the rest is history. Analysts looking at Airbnb underscore the size of the private accommodation market and how more than US$150bn will be spent on alternative accommodation, in competition versus hotels. Those are undoubtedly valid points, but we think that detracts from the true merits of the company and the tenacity of the management team. The company’s true asset is its fundamental understanding of what a customer wants. Some point to culturally enriching local experiences that travellers enjoy by choosing beautiful Airbnb locations as the key differentiator. “Live like the locals do” is the unspoken mantra - certainly helpful in an era dominated by travel bloggers. In fact, the rise of Airbnb has coincided with the rise of Instagram. Travel has become a signifier of wealth and Airbnb has benefited from people buying and selling social currency via their phones in the form of outrageous and artificial vacation selfies, coupled with endless hashtags. Virality is intrinsic and essential to the growth of both products since they are both deeply visual and aspirational. Yet various research pieces, including a comprehensive study by the University of Waterloo (footnote 1), suggest that despite comprehensive segmentation of various Airbnb user types, the underlying differentiator is that travellers save money by using Airbnb, substituting away from traditional hotels - over and above the additional perks. 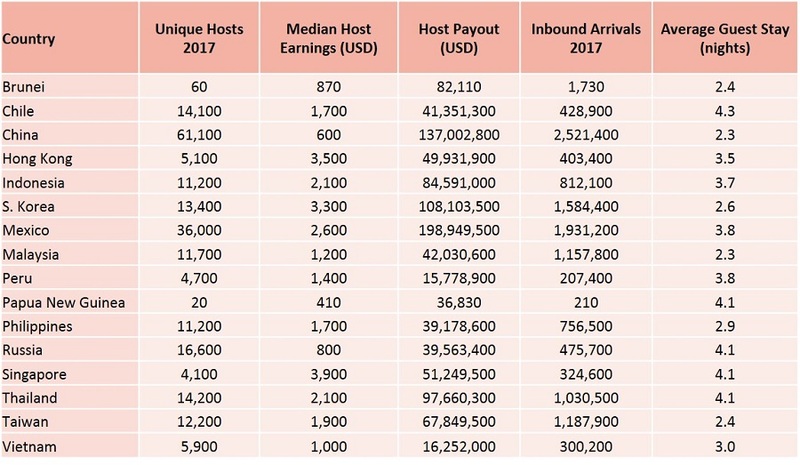 No surprise then that Airbnb as a group squares up as the second largest lodging company in the world (footnote 2), with an offering that’s cheaper and (most of the time) better than the average hotel. And while there is ongoing debate and opposition from the incumbents for protection, especially in developed Europe about the propriety and impact that Airbnb has on the local hotel businesses (empirically, impact to hotel incomes in Europe has been found to be ambiguous to slightly positive (footnote 3)), what is clear is that impact from Airbnb’s expansion is uneven, disproportionately impacting lower-end hotels, especially those that do not cater to business travellers (footnote 4). Most poignantly, the emergence of Airbnb and the prominence of the sharing economy has begun to hold traditional hoteliers to a higher standard of quality, with increasing importance being placed on online reviews and responsiveness ratings. Within the bounds of a 2014 study by Boston University (footnote 5) conducted on the hotel industry in Texas, the correlations were squarely negative: a 1% increase in Airbnb penetration led to a -0.05% decrease in quarterly hotel revenues, hurting hotels which did not service business customers or provide conference space the most. Put differently, were it not for the business and commercial offering that traditional hotels offer, the impact of Airbnb’s inexorable rise would have been even more adverse. The broader benefits are tangible. For example, Airbnb in Thailand is estimated to have supported 21,600 jobs in 2016 between the top two destinations of Bangkok and Koh Samui, generating US$360m of total impact. That same year, Airbnb supported 4,300 additional jobs in Malaysia and 48,100 jobs in Indonesia. Across the planet in Peru, Airbnb brought in an additional US$15.8m of revenues for local hosts, taking more than 207k visitors to its diverse Chinese and Japanese communities. The judgement: 79% of Peruvian adults believe Airbnb is helping the country by bringing in extra income and affordable accommodation. The equivalent statistic in Chile: 77%. Broad-based benefits aside, the business appears to have been run on a tight leash, a refreshing contrast to typical start-up profligacy: based on publicly disclosed data, Airbnb has been profitable at EBITDA level since 2016, with EBITDA expected to grow at a 72% CAGR according to estimates by Morningstar (footnote 7). Although no disclosures on bottom line have been provided, it is unlikely that an asset-light platform business like Airbnb would carry large amounts of depreciation. Add this to a total cash burn to-date of only c. $300m, against about US$3.4bn of equity raised to date, and we see a solid net cash balance sheet. PAT should not be far from where EBITDA currently sits. On Morningstar estimates, the anticipated IPO valuation of US$53bn to US$65bn puts it at a comfortable 18.5x-22.9x 2020e EV/EBITDA for a company growing revenues at a 34% CAGR and EBITDA at 72% CAGR over 2016-2022e - cheaper than some ex-growth industrial companies in India and Indonesia. There are superhosts, and then there’s THE superhost. Room availability on its public listing may well be extremely limited.